If you have resistant hair, or curls that fall out shortly after you finish styling, this tutorial will help! I’m simply curling my hair with the curling iron, which you can watch a tutorial of here, and slipping duckbill clips in to hold the curls in the spiral shape while they cool! Refer to this post to see what products are in my hair. Refer to this post to see my makeup routine. 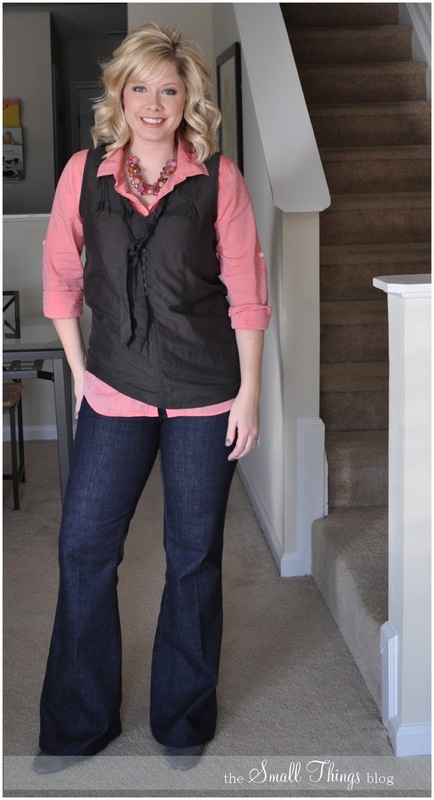 Pink Shirt: J.Crew Outlet, Grey top: Gap, Summer 2011, Jeans: J.Crew, Necklace: New York and Co.
@lindsey: you must have viewed my blog right before they went public! They are public now! Thank you, thank you, thank you! Your tutorials are informative and very well done. It is extremely helpful that you detail what products you use and what can be substituted. I love your style and the fact that you tell us where you purchased your clothes & jewelry. Thank you! My hair is very long (half way down back, with layering starting above shoulders) with fine hair but a lot of it. My hair holds curl great, product normally weighs it down. Without any product I can curl my hair and still have great curl the morning after. But with that being said, my hair cannot be teased. I have tried countless times and it falls flat. It wont stay teased for 5 minutes. Any suggestions on what I’m doing wrong? Or an alternative to teasing to achieve body? Ha nevermind on the organization! I seen your post about it 🙂 great job! LOVE this tip! So perfect. I am going to give it a try. Thanks Kate! I love your blog! I check it nearly every day for something new =) I’m 25 years old and I’ve expirimented with so many products out there to find what works with my hair. I have very thick hair but the individual strands are very fine. It’s pretty long too, well past my shoulders and I am struggling to decide what size curling iron to buy. My hair is wavy so I use a curling iron nearly every day to do my hair like you wear yours in nearly all your videos. I can’t decide if a one onch is too small for the length and thickness of my hair. Do you have any suggestions? Thank you! For me this is a relatively easy qustieon, but has a pretty complex answer. The specialty I have actually looked forward to working with is OB/GYN. I find that the ability of a woman’s body to produce a child, endure the amount of abuse it takes during a pregnancy, and the amount of pain endured during delivery is amazing. The joy of being able to be present as life enters the world is truly one of the greatest moments in life. To me that would be the best possible option. I also would love working in the operating room with a surgeon. I have experienced the OR quite a few times, and have been on both sides of the table. I have to say I would love to work with any surgeon in the OR except for Orthopedics. The reason behind that is the surgery’s are pretty brutal when it comes to the skeletal system. Having been in the OR with an Orthopedic surgeon and seeing the use of the saws, hammers and other heavy equipment in order to perform the surgery just sends chills up my spine. I know that type of surgery is not for me. I think my favorite surgeries have to be that of the abdominal cavity. The specialties that I would least like to work for are few, and for simple reasons. Pediatrics is not a specialty for me since I have four children of my own. My Aunt is a neonatal nurse practitioner and I followed her in high school and saw the good, the bad, and the ugly so I can honestly say I could not emotionally handle that type of position. Podiatry is also an area I could not see myself working. The reason behind this is pretty silly, but here goes, I very much dislike other peoples feet especially if they are not well kept. I know in the medical field you will encounter feet on a daily basis, but I could not mainly work with feet on an everyday basis. My last specialty is Orthopedics for the reasons I noted above about the barbaric nature of the surgeries and treatments for the musculoskeletal system. Its just not for me. Your hair is always so pretty. Thanks for the tutorial! You and your hair are just adorable. Thanks for sharing. I love setting my hair. I’m lucky and don’t have to do it but I love the extra hold I do get without the extra product! I totally did this for my NYE hair style and it worked SOOOO Well!!! I am so proud of myself for being ahead of the curve… or well your blog curve! Hope you are having a WONDERFUL time skiing! I was wondering, do you have any hair tutorials on using hot rollers to curl hair? I have always wanted to use them but they seem so intimadating. Thanks so much! Happy New Year! Thanks so much for your blog. I also am a hair stylist. I have been doing hair for almost 18 years and am also a licensed instructor, but it is nice to get some new ideas and inspiration from other people. I tell my students all the time that you never stop learning. I also have a ghd and love it. Thanks so much! Any suggestion for the next best flat iron? It just makes me crazy to spend almost $200 on the GHD! Thanks! Hi Kate, thanks for the tutorial. I love your videos and blog. I’m a reader/viewer from France. Do you know if it is possible to find Hottools irons with French plug ? hey Kate! Love your blog. I have long hair (5 inches past shoulders)and noticed you leave the ends out of your curling iron when curling. Should I leave more than an inch since my hair is longer. It just always seems to turn into one curl and my hair always seems to all end up in front of my shoulders in 2 chunks…thanks for any advice! Omg! I have been looking for a great hair blog! And I found it! I found you on Pinterest! Do you recommend a curling wand? I see you use curling iron so just wanted your input. As one of your readers with “resistant” hair, I thank you! Can’t wait to try some duck bill clips. I have a friendly suggestion…ever thought about hanging a mirror above your towel rack? You would be able to see the back all of the time, and so would viewers watching your videos. Looking forward to hearing about Deer Valley! @Anonymous & @vanessa: I have one and am working on a tutorial! @domestiCate: great idea. I’ll look into that! @Braziltrip: yes, try leaving 2 inches out. And finish with some flexible hold hairspray to keep the curls from joining together. @FrenchieLaVie: I’m not sure about that! @anonymous: look into a 1 1/4 size. I think that’s better than a 1 inch. @hannah: your hair may just be too long. Long hair, whether thick or thin, is challenging to keep volumized. Have you tried a root lifter? I like Aquage Uplifting Foam best! I just wanted to tell you that I LOVE your blog. I have been reading it now for several months. I am so tempted to one day travel from Alabama to NC just so you can cut & style my hair! Hey! 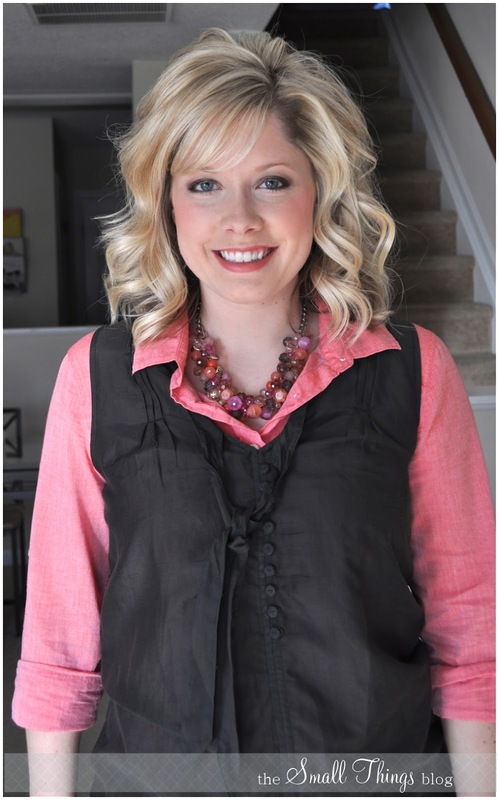 I love your blog…I was wondering if you had tip on doing this look on a shorter hair styles? I went and had 13 inches cut off and donated to locks of love and the stylist cut my hair at an awkward length…between a Bob and your length and I have no clue what I can do with this. Tks! I wanted you to know that I found your blog on Pinterest and I am so happy I did. Without knowing it, your fabulous hair tutorials gave me the courage to cut about 10 inches off of my long hair. My hair is now shoulder length and I am SO happy with the change! I had been thinking about this change for years, don’t know what took me so long! So thank you! For this amazing blog and the time you put into your videos. I absolutely LOVE your blog!!! I’m a preschool teacher and can pretty much wear jeans and whatever I want to school each day. Your ideas and outfits inspire me to get up and actually get ready each morning! Thank you for taking the time to share all of these ideas with us! LOVE your blog! Thank you so much for this setting curls tutorial…I bought a smaller barrel curling iron (1 inch) and followed this tutorial. I’m loving my hair today! Hi, I also found you blog through pinterest. And of course I am loving it. I have such a hard time explaining to the stylist what I want done to my hair. Do you have any tips. How would you explain to a stylist how you would want your hair cut. My inch is usually 2 inches to them. My idea of long layers is usually not enough layers to me. THANKS! I’ve been considering purchasing a curling iron like you use in your tutorials. I’ve been using a Sedu straightener to curl my hair like a curling iron. Before I spent the money, I was wondering if you had a preference for one or the other, a straightener or a curling iron? If one was quicker/easier to style with? Thanks! Can you please check mine too??? I just stumbled on your blog from Pinterest. Love your BLOG! It will be a regular for me to read. Thanks for all the tips. Love, love, love your tutorials! I love watching your tutorials your such a sweet natured woman! I have tried curling my hair and it looks great for the first ten min then falls flat. My hair is about mid back length and I was wondering if you had any suggestions to make longer hair hold curl better. Really enjoyed this tutorial. I have never been very good at doing my hari (more like taking the time I guess), but you inspired me. Thanks so much! Will the aquage help my hair hold a tease? Right now it doesn’t, but I am waiting on my product to come in. I love your tutorials about curling hair! Who would have thought that at almost 30 years old I am finally learning how to curl my hair in a way that makes it FINALLY look good! I am going to try this next because I have fine hair and curls tend to fall out easily. My hair is long (about to middle of my back). What products would you recommend to help me hold a curl other than hairspray? Thanks! I am loving all your tips on stlyes, i found the site by googling and i haven’t stop reading past posts and all the updates! very exciting to try out new things and even try make up tips! I love all of your tutorials on youtube! Please do a video showing how you style your bangs! Thank you for sharing all of your tips! I love your blog!!! It’s so inspirational!!! I can’t get my hair to stay curled!! I bought aquage uplifting root mousse, I then blow dry my hair upside down, section my hair off, spray with a light mist of aquage hair spray then curl with a hot tools curling iron and put the duck bill clips in. After I am all done I let it cool for 10 min and when I take all the clips out and “rake” my hair out.. it is straight! HELP! How can I get the curls to stay after I put all that work in?! You hair looks so light and fluffy after removing the duckbill clips, my hair must be thicker, so it looks and feel heavy. Anything you can suggest to help with that? Your blog is AWESOME! I have a cut similar to yours (maybe half an inch shorter) but I have naturally “poofy” hair and it’s pretty curl and straightener resistant. Will def give this a try! As you’re sectioning off each curl BEFORE you even spritz it with hairspray, your hair looks kind of stiff… Do you use some kind of leave-in product, or heat-treatment product prior to blowing it dry? I have very fine/thinning hair and have been letting my natural color come grow in from a darker brown and MAYBE put heat to it 1-3 times a month – it’s naturally wavy/curly, so i usually mousse and go – But I’ve grown tired of these unruly random waves and want to try and tackle a style like yours, BUT when I sick it with a curling iron, the curl falls out almost instantly, hairspray or not. Naturally curly, but won’t hold an artificial one – go figure. Thank you for this great and informational post. I have curling ıron and I love using it .I think it is the best and most healty tool for hair. But I realized that I couldn’t use it like you. You look an expert. I will apply your tips and ıt will be very easy for me. Hey Kate, I posted on one of your recent ig posts. Question on your (current) cut, color and how you style it since this video. Is it pretty much the same – just longer? My questions on cut and color. I have a lot of medium brown baby fine, curl resistant, heavy hair. It’s also quickly graying, and my stylist had to switch to a permanent hair color several months ago. Anyway, I would like to go more blonde in my highlights – similar to yours. And I am loving your current cut as well. How would you describe your cut? Do you have bangs or is it framed at the face or just long layers? What do you do for your color? And what is your natural color? My current stylist has been doing my roots to match my natural color then dark gold/caramel color highlights – she said she doesn’t use bleaching products. So I’ve got a consultation with a new guy this week. I’ve heard of balyage (sp?). What do you suggest? Ty! And every blessing to you! You and your boys are so cute! I love following your blog!